*The third day will be a hands-on onsite sustainability tour of Chatrium hotel, learning about various sustainability practices implemented at the hotel. 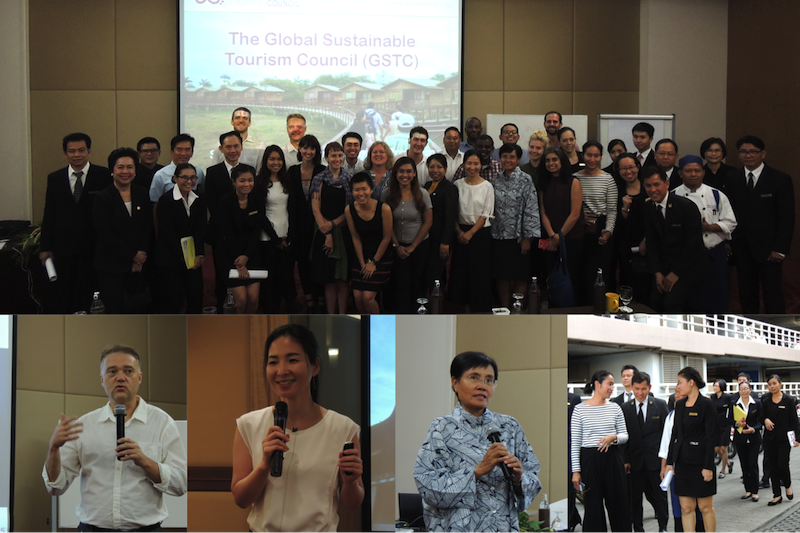 The three-day intensive and interactive training program (26-28 March 2018) is designed for travel and tourism industry professionals interested in learning about sustainability best practices for businesses and destinations. The training covers tourism as a tool for sustainable development, sustainability best practices and the GSTC Criteria, the world’s leading standard for tourism sustainability, as well as key topics such as global trends in sustainable tourism, sustainability marketing, and sustainable tourism product development and management. 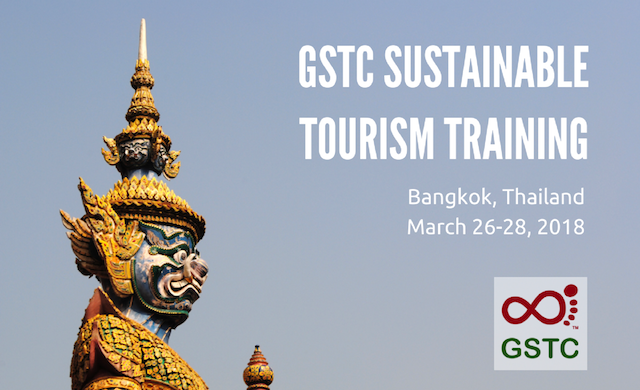 This training class is organized by the GSTC with the support of the Pacific Asia Travel Association (PATA). SOLD OUT: Registration for this training is now closed. If you would like to be added to the wait list, please contact training [at] gstcouncil.org. You will receive an email notification (latest by 17:00 on CET Friday, 23 March) if there is any cancellation or if space becomes available. If you would like to receive updates on future GSTC training classes, please sign up for our newsletter. We also offer online training options, and three courses are scheduled in 2018: April 2-27; July 2-27; and Oct 15 – Nov 9. 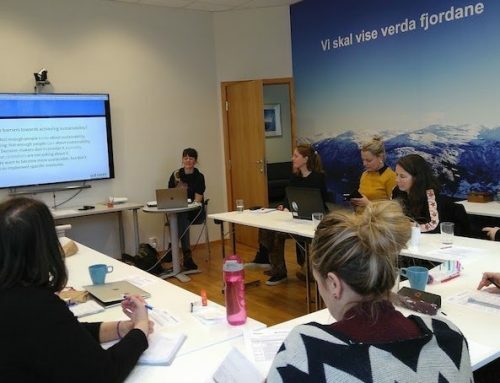 The three-day intensive sustainable tourism training program covers global trends in sustainable tourism, sustainability best practices and the GSTC Criteria, with the aim of strengthening awareness of sustainable tourism through practical insights and achievable steps. Knowledge and expertise representing the GSTC as the global authority on quality sustainable tourism standards. 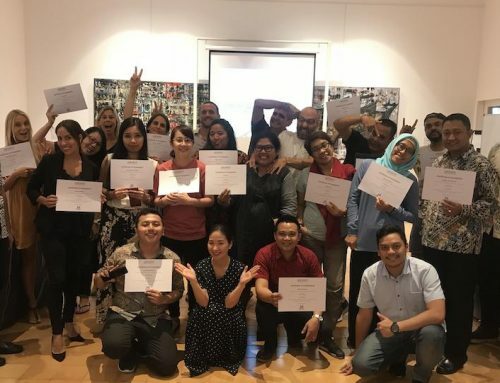 Stimulating and rewarding learning experience, being part of an interactive training with fellow participants representing a variety of public, private, academic and non-profit entities. Practical insights on promoting sustainable and responsible travel experiences through case studies and best practice examples. How Will the Training Benefit Your Work? You will be able to make informed decisions on how to implement sustainability practices for your company or destination. You will be able to build and establish viable and actionable sustainable tourism policies and practices for your organization. You will have the opportunity to participate in the official GSTC Sustainable Tourism Training Program (STTP) Exam, and upon successful completion, receive a Certificate in Sustainable Tourism by the GSTC to demonstrate your knowledge of sustainable tourism standards and practices. You will be able to complete the training requirements towards earning a Certificate in Sustainable Tourism by participating in this training class. After the training class completion, you will receive instructions on how to access the STTP Exam, which is offered in an online and open-book format, and is available for one month after the training dates. Dr. Mihee Kang is the GSTC Country Representative for South Korea, and serves on the GSTC Accreditation Panel as a sustainable tourism standard expert. 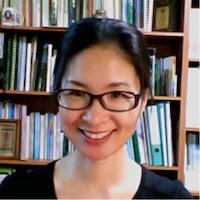 Dr. Kang is a research professor at Seoul National University, researching topics related to protected areas management and sustainable tourism. She received her Ph.D. degree at Seoul National University in 1999 and actively participated in numerous ecotourism and protected area projects in Korea and abroad. She has published many articles and books including the first ecotourism book in Korea and the recent one about ecotourism in ASEAN Countries. She serves a number of key positions in both domestic and international organizations such as Ecotourism Korea, Korean Geoparks Committee, Korean UNESCO MAB Committee, and Asian Ecotourism Network. Recently she co-founded Playforest, a cooperative of sustainable travel businesses designed to benefit local communities and local activists dedicated to the conservation of their forests and to provide genuine community-based natural tourism experiences to the visitors. 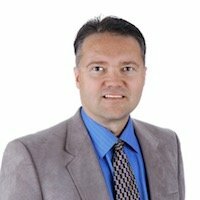 Randy Durband has had two careers in travel and tourism – 20+ years in senior leadership positions at some of the finest U.S. tour operators, having served as President for Travcoa, INTRAV, and Clipper Cruise Lines, plus Executive Vice President of Tauck World Discovery. Following that, in his second travel and tourism career, Randy advanced the work of Sustainable Tourism as an advisor, consultant, and speaker. He brings his knowledge of the business of travel, his global network of travel professionals, and a passion for sustainability to support the GSTC and the general sustainable tourism movement. Benjamin is the founder of LightBlue, a regional auditing, capacity building and consulting firm supporting Hotels willing to improve profitability and minimize their social and environmental footprint. He started his career with the Accor Hotel Group, being responsible for the implementation of the environmental certification program ‘Green Globe’, also known as EarthCheck, in 44 Novotel properties throughout 9 countries in Asia. 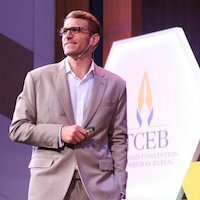 He since worked across Asia with various prestigious partners from the private sector (Accor, ClubMed), governmental agencies (TCEB) as well as from International Organizations (UNILO, EU). Benjamin has been a pioneer on the topic of Food Waste Prevention in the hospitality, has developed one of the most comprehensive standard to date, integrating implementation of a food waste monitoring system, online tracking of data, capacity building and revision of SOPs at critical food waste generation points. Benjamin is as well an international guest speaker, a guest lecturer in hotel management schools (Thailand, Germany), a judge for International Sustainable Tourism Awards (SKAL, PATA) and an active member of several sustainable tourism working groups (GSTC). 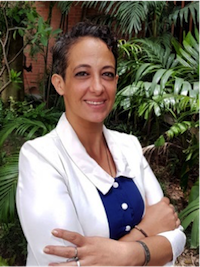 Gabriela Kühn is the Head of Programme against Sexual Exploitation of Children in Travel and Tourism (SECTT). She is in charge of the ECPAT programme strategy to combat sexual exploitation of children through implementing the Global Study recommendations. The Global Study is the largest pool of evidence ever gathered on SECTT thanks to a unique global partnership of 67 partners. Gabriela has over 10 years of experience working in child rights NGOs. 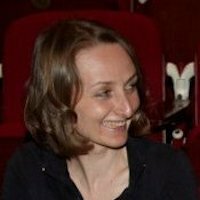 Prior to joining ECPAT Secretariat in Bangkok, she was the Programme Coordinator at the ECPAT member organisation in Poland. Gabriela was in charge of the “Don’t look away!” campaign, The Code of Conduct for the Protection of Children from Sexual Exploitation in Travel and Tourism as the Local Code Representative and managed a nationwide grant distribution program aimed at preventing child abuse and protecting children from violence. She worked also for other NGOs in Europe, which provide direct help and support to children. Gabriela holds The European Master’s Degree in Human Rights and Democratisation (E.MA) from The European Inter-University Centre for Human Rights and Democratisation (EIUC), a post-graduate degree in International Co-operation and Development from the Department of International Studies in Padua, Italy and Master’s degree in foreign languages from the University of Warsaw, Poland. Gili Back is the Sustainability Manager for Khiri Travel Thailand. Khiri Travel Thailand is the 1st company to have passed their 2nd audit certification for Travelife at this point. 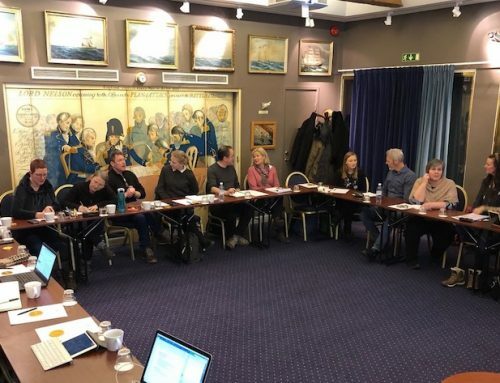 Working closely with Travelife, PATA, WAP, Global Spirit and other tour operators. Khiri has helped create previously non-existent guidelines and criteria for captive elephant camps in Thailand, setting the standards for the rest of Asia and the world to ensure the welfare of elephants and the mahouts that work with them, whilst presenting scientific facts, new techniques and best practices to visitors and lobbyists to set their minds at ease. Gili is also the Executive Director of Khiri Reach, a charity organization established by Khiri Travel to help disadvantaged people through community development, conservation, environment and empowerment projects. Khiri Reach has already set up programs in Thailand, Laos, Vietnam, Myanmar and Cambodia with more coming in Indonesia, The Maldives and Sri Lanka, focusing on educating and working directly with people in rural areas and city zones to improve their living conditions in a sustainable way. Khiri identifies bona fide projects that need funding, advise donors and volunteers and 100% of donations go to beneficiary projects, with Khiri Travel covering all overheads whilst coordinating with local NGOs and projects. Khiri also provides manpower as all staff members are allocated 5 paid working days each year to dedicate to the projects they wish to lead. *For GSTC Organization members, the above member discount is available to all staff members and can be used for an unlimited number of times. As part of our partnership with PATA, the GSTC offers the special reduced rate to all current members of PATA. As part of your registration, you will receive training materials to be provided prior to the class; lunch and coffee breaks during the training dates; and a Certificate of Completion confirming your attendance in the class. You can sign up multiple people at the same time when registering online. Select the number of people you would like register, and you can enter contact details for each participant on the form. We also offer a discount for each group purchase of more than 5 seats. 5-10 people: US$ 475 per person. If you would like to sign up as a group of 5 and more, please contact us (training@gstcouncil.org) for more details. We offer a limited number of need-based discounts to current students and professionals who demonstrate genuine needs. To apply, please submit this application form. Travel expenses related to the training class are NOT included in the registration fee. If you would like to book a room at Holiday Inn Bangkok Silom, please see the group rate and booking form here. Sign up to receive email updates on the STTP.